What Mathematical Factors Influence the Sport of Water skiing? The idea of walking on water has fascinated thousands of people for hundreds of years. While that specific idea is not possible, skimming across a body of water on a pair of skis has become a reality. Water skiing is a sport that has a ton of mathematical concepts behind it. Whether it is the lift involved with the angling of the skis or the pressure dealing with the force and pull of the boat, water skiing is full of math. Many researchers have provided much helpful data to fully explain the questions that people have come across. An experiment using two different subjects provided many results that help to show how these concepts work in real world water skiing. Background: The sport of water skiing has been around for almost one hundred years. Its origins began during the era of the Roaring Twenties when Ralph Samuelson became the first man to attempt the idea of flying on water (Michael, 2006). However, it was not until after the Second World War, that water skiing really became popular, due to the availability of high-horsepower boats. Soon afterwards, Osborne Reynolds began researching the turbulence of the water to determine the ideal type of water for the skier. 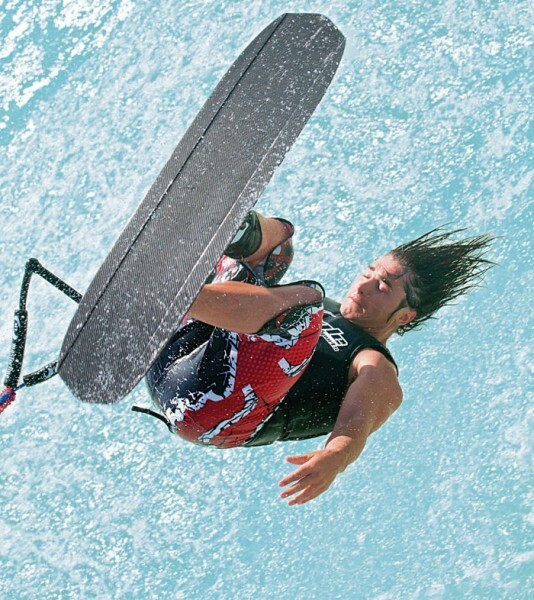 He concluded that laminar, one of the two types of fluids in motion, allowed the skier to keep their balance more efficiently than the turbulent wake (Michael, 2006). In order for a skier to skim across the water, gravity, drag, pressure, and the water, itself, must work together. While in the water, it is necessary that the skier bends their knees and tilt their skis up and out of the water at an angle. the force of the boat when it begins to pull the skier. However, the tilt of the skis is also the source of the lift, which will effectively pull the skier out of the water (Rye, 1987). Newton’s Third Law states that for every action there is an opposite and equal reaction; in this case, when the boat begins to pull the skier forward, the skier responds by leaning back to counter the force of the boat. However, due to the power of the boat as compared Factors Influencing Water skiing to the person, the boat will successfully pull the skier up and out of the water (Michael, 2006). The drag caused by the lift is dependent on how the ski is placed in the water. After being pulled up, the skier must continue to lean back slightly in order to continue resisting the force of the boat; if the skier attempts to stand completely vertical, then the balance between the pull of the boat and the resistance of the skier is lost, resulting in a fall (Teague, 2004). Another factor that has an important effect on water skiing is the speed at which the skier is being towed. A skier weighing one hundred fifty pounds would require an average speed between twenty and twenty-five miles per hour, which is roughly between seventeen and twenty-two knots (Michael, 2006). 25 Miles per Hour = 21.756756756756754 Knots These average speeds will vary depending on the weight and height of the skier. Slaloming, skiing with one ski rather than two, requires faster speeds because the surface area of the skis is smaller. The smaller the surface area, the more the boat will have to pull the skier to fight the slightly larger force of the skier (Michael, 2006). Research Question/ Problem: What Mathematical Factors Influence the Sport of Water skiing? Methods: After researching the many factors that are involved with the sport of water skiing, a simple experiment involving two people was performed to justify how the mathematical factors actually apply to real-life water skiing. This test involved two subjects: Subject A and Subject B. Subject A was six feet in height and weighed one hundred seventy-six pounds. He is also fifty years of age and wears shoe size eleven. Subject B’s height was also six feet, but he weighed only one hundred sixty pounds. Subject B is fifty-one years old and wears size ten in shoes. Another factor that must be taken into account is that Subject B works out on a daily basis, and is therefore more physically fit than Subject A. In order to discover true results, it was necessary to control certain variables such as the tow rope, the speed of the boat, and the skis used. The tow rope that was used for both subjects was seventy feet in length, and the boat’s speed was thirty miles per hour, or about twenty-six knots. 2. The distance required for Subject A to pull up out of the water was also recorded. 3. Subject B followed the same procedure as mentioned in the steps above, making sure that the independent variables were not changed. 4. Subject A then followed the same steps, but changed from slaloming to skiing with two skis. Two times and the distance were also recorded. 5. Subject B also performed the same steps, checking that no other variables were changed. It can be seen from these results, that Subject B was able to pull up out of the water quicker and in a shorter distance than Subject A, for both the one ski test and the two ski test. One of the reasons for this is the sixteen pound difference between Subject A and Subject B. Because Subject A weighed more, he was able to apply more force to resist the pull of the boat. His extra force still could not match the pull of the boat, therefore he was still pulled up out of the water. This explains why Subject B’s distance is so much shorter than Subject A. The second reason for the differences is the subjects’ physical fitness. It was easier for Subject B to pull himself out of the water because he has more physical strength than Subject A. It is also easy to see from the table that both subjects were able to cut their times and distances by using two skis rather than one ski. As mentioned earlier, slaloming requires faster speeds because of the smaller surface area. Since, the control for the speed of the boat was set at thirty miles per hour for both tests, the data proves that skiing with two skis allows the subjects to be pulled out of the water quicker and in a shorter distance than slaloming. In today’s society, people see water skiing as just another sport. However, what they do not understand is that the sport of water skiing has much more mathematics involved in it than most people realize. A few of the factors that work together include gravity, drag, pressure, and the water. If any of these concepts were to be taken out of the equation, then the idea of water skiing would be impossible. After performing a simple test, the results confirmed that mathematics had different effects on different parts of the experiment. In order to achieve more results from the test that was performed, there should be a greater number of subjects, as well as a range of the subjects including age, weight, and abilities. The two subjects used in the mentioned experiment were very similar to each other in many ways; therefore, to obtain more results, it would help to create a more varied test group. Skiers are applying pressure as they are waiting for the boat to pull them out of the water. The boat applies force to pull the skier forward and out, while the skier counters the boat by leaning back at an angle. All of these actions required the skier to subconsciously use mathematics to work with and against the boat in order to pull the skier up. [Electronic version]. Mathematics and Computers in Simulation, 34, 163-181. Macken, J. (1997). Water ski performance analysis method and apparatus [Electronic version]. USPTO Patent Full-Text and Image Database, 5694337.